Your one stop place for LED Lighting! 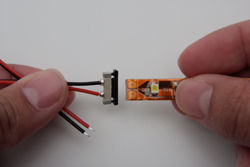 Welcome to the site of LED Distributors! We are proud to offer the latest in LED lighting to our customers. With rising energy prices LED lighting is really a simple, and revolutionary option for lighting in your home or business. Give your latest project a cutting edge look with LED Lighting. The LED changeover is inevitable; LED lights have the greatest energy efficiency compared to traditional incandescent, halogen, or any other light bulbs. If you are renovating your current cabinet lights or you are installing new under cabinet lighting, LED flexible strip lights are an easy option. Great solutions for kitchen under cabinet lighting, cupboard or counter lighting, task lighting, or garage and closet lighting. LED flexible lighting strips can easily be placed under cabinets, counters, behind TVs, under cars, or can be used as cove lighting or accent lighting. An almost infinite amount of color combinations. Very bright, great for bars, clubs, home lighting, TV backlighting, and more. We offer a variety of LED Light Bulbs that are long lasting, durable, and energy saving. We have a variety of connectors that will make your installations fast and easy. These accessories are what you will need to make your installation easy. We distribute cutting edge 2014 LED lighting products such as Flexible LED Strips, LED Under Cabinet Lights, LED replacement bulbs for series MR16, GU10, E26 (medium base), LED modules and a variety of accessories that you will need, including LED dimmers. Along with LED lighting products, you'll find great LED installation tips and other DIY videos, for Flexible LED Strips, LED Under Cabinet lighting and accessories, which will help with your projects. Our under cabinet lights are ideal for placing under kitchen cabinets, under your breakfast bar, can be used for decorative lighting, to enhance your end table. Best of all they can be installed yourself, it is not hot to the touch and is completely energy efficient- eco friendly! An easy, durable method for adding LED lighting in almost any location! These flexible LED strips can be easily placed under counters in kitchens, office kitchens, behind TVs, under cars, behind a hanging mirror, or picture in your home or office, use them in your boat or as cove lighting and accent lighting. These lights are RGB LED flexible colored strips, with an infinite amount of color combinations; these lights are bright and great for back lighting in bars, clubs, and can be used for home use as well as backlighting for your TV and more! Are you looking for a new replacement to those normal everyday bulbs? LED bulbs are a smart alternative to regular incandescent, fluorescent or halogen bulbs; they’re more durable, longer lasting, and there is less heat emitted from LED bulbs- so you won’t have to worry about them over heating your rooms. We offer an easy option for connectors; there are three types to choose from that are simple to use and are color-coded for your convenience. If you are using flexible LED strips, or installing under cabinet lights, our connectors are fast and easy to use. Check out our easy to follow installation instructions. There are a lot of different options for your LED lighting, and we’re proud to offer exactly what you need to make sure you are able to use your LED strips. You’ll love the simplicity of the LED light dimmers, we offer NEW LED touch dimmers, LED remote dimmers, mounting sleeves, which are clear and water resistant and can virtually be placed anywhere you need them. We also offer double sided tape, and stranded wire for all of your projects!